In a 4-quart soup pot, bring 6 cups water to a boil; meanwhile, prepare veggies. For the asparagus, rinse and pat dry; remove and lightly chop the tops; shave the stalks with a vegetable peeler; set aside. For the snap peas, rinse and pat dry; cut into bite-sized pieces; set aside. When water has reached a rolling boil, carefully drop gnocchi in; when it floats, it’s ready, about 3 minutes. Once gnocchi has softened, pour into a colander, rinse with cold water (to stop cooking), pat dry with a paper towel (to avoid skillet splatters); set aside momentarily. Preheat an 11-inch skillet over medium heat (nonstick NOT required); add olive oil. To this, add gnocchi and sauté on one side until browned, about 2-4 minutes; flip gnocchi to brown the other side, about 2-4 minutes. Remove gnocchi from skillet into a bowl; set aside momentarily. To the skillet (still on medium heat), add snap peas and sauté until slightly tender, about 3 minutes, tossing as needed. Add shaved asparagus, gnocchi, salt, pepper, and cubed butter; toss to combine and heat until warmed through, about 3-5 minutes. Plan to serve immediately, either from the pan or individual dishes; squeeze lemon over surface, sprinkle parmesan cheese, and scatter lemon zest. 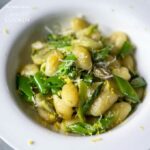 This recipe for Pan-Seared Gnocchi with Shaved Asparagus and Snap Peas was printed from AmandasCookin.com - https://amandascookin.com/gnocchi-recipe-asparagus-snap-peas/ and can only be printed for education or personal use.